In 2007, the first Presidential dollar coins were released, honoring former deceased United States presidents in the chronological order that they served the nation. The Presidential dollar series, which was signed into law in 2005, permitted the production of this series, which followed in the wake of the successful 50 States Quarters, a wildly popular series that spanned from 1999 through 2008. The Presidential dollar coin law stipulates that for a president to be honored during the series, he (or she) must have died at least two years before his (or her) coin was to be issued. The dollar series is slated to conclude in 2016 with the issuance of the Ronald Reagan dollar. Neither immediate predecessor Jimmy Carter nor any of Reagan’s presidential successors are eligible to be honored during the Presidential dollar coin series because they were living as of January 1, 2015. The Presidential dollar coins were originally produced and intended for widespread circulation and were heavily promoted by the U.S. Mint and the numismatic community at-large. However, the Presidential dollars failed to gain much traction in standard commerce channels for much the same reason other recent attempts at circulating dollar coinage have flopped – the dollar bill concurrently circulated. With more than $1.4 billion Presidential dollars sitting in Federal Reserve vaults as surplus, the U.S. government suspended production of the dollar coin for circulation. However, the U.S. Mint is still producing Presidential dollars for numismatic distribution in coin sets. 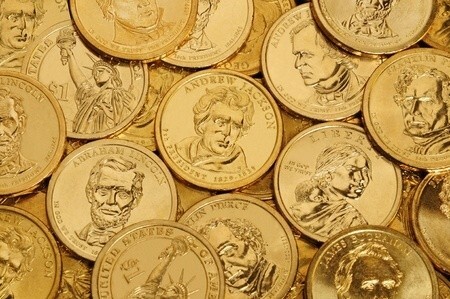 What Are Presidential Dollar Coins Worth? Generally, business-strike Presidential dollar coins are worth $2 to $3 in uncirculated condition. Proof specimens are valued at $7 to $10 each. One of the most valuable Presidential dollar errors is the 2007 George Washington struck-planchet, unlettered-edge dollar error. It’s valued at $5,000 to $10,000.